For spot-welded structures (such as automotive bodies) the weld elements can be generated automatically for various types of attributes such as crash, NVH, durability etc. Specialized features such as weld force failure, heat affected zone modeling around the spot welds etc. are available for more in-depth modeling of the welds. During early stages of the product development spot weld lines and spot weld points can be automatically generated using the part meshes. For fabricated structures involving seam welds the weld elements can be generated using a wide variety of configurations such as quad, beam, solid, rigid elements etc. 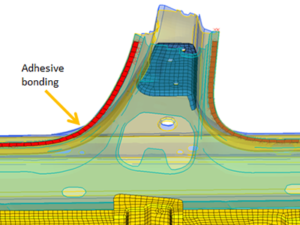 For detailed modeling of the weldments using solid elements, options are available to automatically create the weldments and have node-to-node matching connection to the surrounding parts. In locations where adhesive bonds are required solid bond elements will be generated automatically and connected to the surrounding part meshes through connection equations, contacts etc. 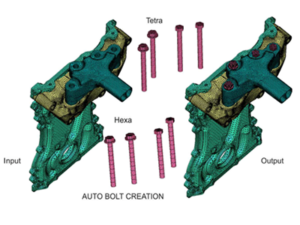 A wide variety of bolted assembly connection elements can be automatically created. These involve a) through bolts, b) screws, c) detailed metric bolt modeling, d) bolt connections with beams/rigids etc. 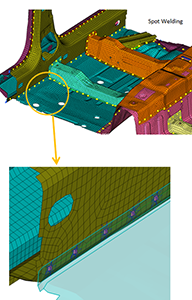 Extensive contact modeling is available with automatic contact surface creation between all components of an assembly. The contact pairs can also be generated between the contact surfaces with appropriate interface conditions such as friction, thermal properties etc. A wide variety of loads and boundary conditions for various types of problems can be applied in a quick and efficient manner. For very large scale system models an include file management system has been provided. Users can organize sub-assembly data into include files and perform data manipulation operations across different include files.